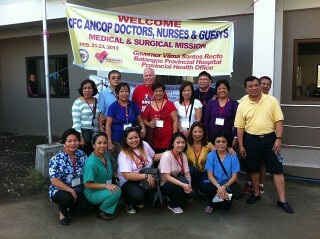 Dr. Wania-Galicia, (second from left in front row) together with a group of other physicians, surgeons, and medical support staff from the United States of America visit rural communities in the Philippines providing medical care to people in urgent need who would othewise not receive help. In this picture, Dr. Wania-Galicia is shown with the ANCOP team that served in Lemery, Batangas in The Philippines in 2013. She currently serves as the ANCOP-Health Director for the US-western states. 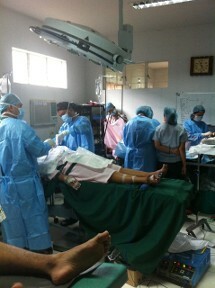 The patient in the third bed is having a total abdominal hysterectomy to remove a cancerous mass in her uterus. 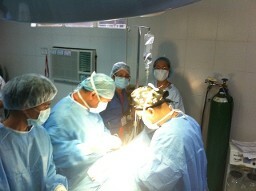 Dr. Wania-Galicia (with back to camera) is the Assisting Surgeon. Conducting multiple procedures in the same operating room not only eliminates patient privacy but greatly increases potential for infection. These are the cases they see in medical-surgical missions in other countries. 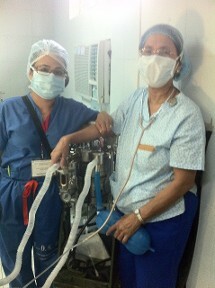 Dr. Wania-Galicia (left) is shown here with the Director of the Anesthesia Philippine team who is using a hand operated air pump to ensure that the patient maintains proper oxygenation during surgery. The lack of modern equipment poses extra risk and requires additional personnel. Providing anesthesia (third from left) for a thyroidectomy required by a patient suffering from a goiter. A condition rarely seen in developed countries where iodine is routinely added to salt used in food production to prevent this debilitating and totally preventable disease.